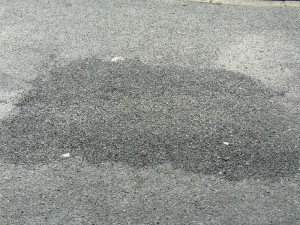 The council has got itself into an awful mess due to a failed road repair in Bleasdale Close, Unsworth. 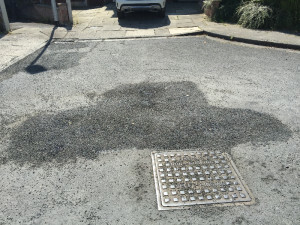 While residents were initially pleased that the council’s highways department was finally filling in the numerous potholes in the small cul-de-sac, that pleasure soon turned to horror when highways had finished the work. A couple of years ago the Council purchased new road surfacing machines at a cost of £100,000 unfortunately it seems like they forgot to purchase the user manuals (or at least sort out some training for their highways staff) as the spray injection patching machines (also known as ‘jetpatchers’) that were used to fill in the potholes on Bleasdale Close have a specific operating temperature, a fact that appears to have been lost on the Council. While it is not clear which jetpatcher system has been purchased and operated by Bury Council’s highways department, a quick google search and perusal of the different systems show that they can only be used within a strict surface temperature range. 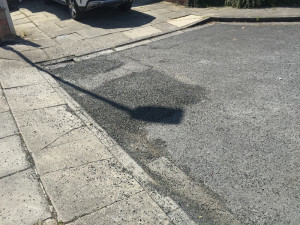 The council decided that the hottest day of the year would be the perfect time to do the repairs on Bleasdale Close, a decision that meant the repair was doomed to fail. As a result of the failure, the bitumen and aggregate failed to set and local residents on the cul-de-sac soon found bits of the hot, sticky tarmac on the shoes, on their cars, on their driveways, in their houses and in one case, in the cot of a young baby. All of the residents have complained to the council, who have not so far acknowledge their error, have not said sorry and have so far only invited Bleasdale Close residents to fill in claim forms. The story has been featured in this week’s Bury Times and I’ve called on Bury Council to apologise to residents, and then quickly resolve the situation by putting the road right and compensating those affected quickly, without fuss and in full. Instead of this, all we have had so far is a rather vague statement from Councillor Alan Quinn in which he neither acknowledged the errors or state how the council was going to rectify the situation. Instead, Councillor Quinn used the opportunity to talk about how many potholes they had fixed with their new machines, something which will be of small comfort to those still living with the loose chippings and damaged carpets, driveways and vehicles. As usual, the three Unsworth ward Councillors are AWOL and have not engaged with residents at all over this matter. I’ve taken this matter up on behalf of some of the residents on Bleasdale Close and will be ensuring the council adequately compensate those affected. A full apology would be gratefully received by all. If you have been affected by this issue and have no contacted either the council or me, feel free to give me a call on 07870 444 235.